Groveport is located about 8 miles southeast of Columbus. How Groveport got its name is a fascinating story about 2 men with different ideas that worked out a compromise that worked. In 1812, Adam Rarey, an original settler in the area, built a log tavern here. Later, his son William, donated land for the Methodist Church and continued doing things to develop the community. 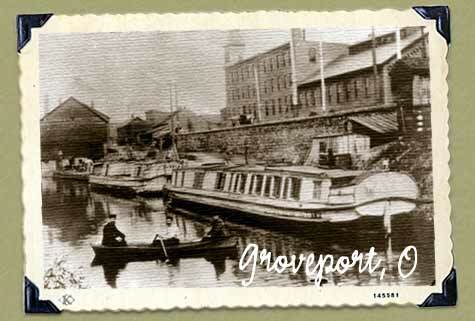 By the mid 1830s, the Ohio and Erie Canal had already come to the little area we know today as Groveport. Back in the 1800s, that was an important factor in whether a community survived or not. It wasn't long after the canal came that a railroad line came through and connected the community with Columbus. Having a rail line would become even more important in the coming years for any community. The canal opened in the un platted village in September, 1831 and it had one lock and later a canal boatyard and dry dock was operated in what is now Blacklick Park. Canal boats were built and repaired here and this was considered the first such operation on the canal below Baltimore, Ohio. It was the canal that really brought things in the village to a head. The community was growing. New businesses were arriving, there already was a post office and the railroads weren't that far away. The problem was, the village had two different names and they were divided by an imaginary line that ran north and south right through the village. To the west of that line was Wert's Grove and to the east, it was called Rarey's Port. The village was growing, people were beginning to notice the area, but which area: Wert's Grove or Rarey's Port? The village needed to make a decision, work out some sort of compromise. The two main characters that were forcing this compromise were Jacob B. Wert and William H. Rarey. Both men had had the same vision: creating a village along the canal that would become prosperous and attract new businesses. Rarey thought he had the upper hand since it was his father that built the first tavern their. Wert thought he was in the right, since he was the post master and he had done all the work laying out the town in such a way as to make it very attractive for the Ohio & Erie Canal to come through there. In 1846, the townspeople decided it was time to make a decision and put all the bickering behind them. After all it was almost the middle of the 19th Century and Ohio was growing by leaps and bounds. They needed a name that everyone could use. The first meeting didn't go so well. Neither of the two gentlemen wanted to give up their naming rights, and of course, all that fame that would be associated with their names 100s of years in the future. It was at the second town meeting held early the next year that Dr. Abel Clark suggested the name Groveport. This was a good solution to a bad situation. Neither man would have his name associated with the new village, but both would share in its creation. The name was readily adopted in April of 1847 and the village of Groveport was incorporated. Groveport is located just 15 minutes from downtown Columbus and is the gateway to Rickenbacker International Airport, a designated foreign trade zone offering many cost savings in the area of city, customs and quotas. The sense of community in Groveport is rich, with a proud heritage and progressive leadership. From a revitalized central village, to the preservation of a pioneer home, the people of Groveport know their success today has been the result of honest work, and determination. 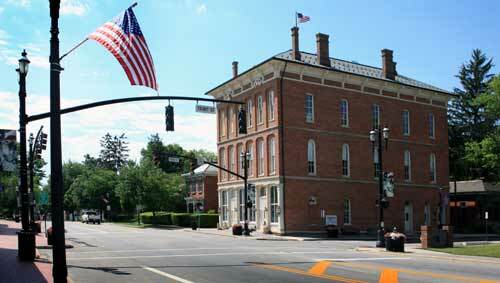 Located in Groveport's Town Hall, 648 Main Street, the GROVEPORT HERITAGE MUSEUM displays historic artifacts and memorabilia dating to the Village’s founding in 1847.